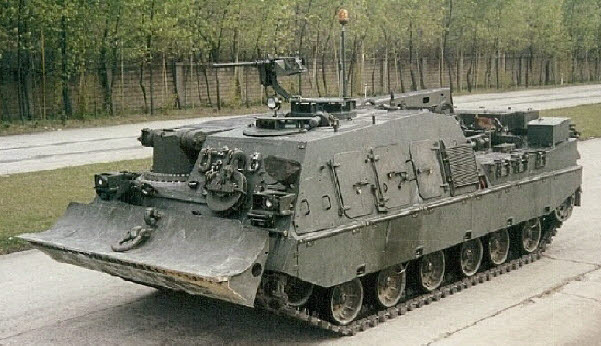 The ROKA K1 Armoured Recovery Vehicle was developed from 1989 to 1992 with technical support of German Kruff Mak maschinbau Gmbh in its recovery systems and was entered ROKA service in 1993. The K1 ARV uses a crew of four. Its advanced crane, winch and dozer systems allow it to perform damaged vehicle recovery missions, and to provide maintenance service for armoured vehicles. The K1 ARV uses common components of the K1 MBT and has the same mobility performances to keep up with the K1 MBT. With a combat weight of 52 tonnes, its regulated maximum forward speed on paved level surfaces is 65km/h ; its cross country speed is 40km/h. The dozer, located in front of vehicle, is hydraulically controlled. The dozer system is designed to stabilize the vehicle during craning and winching operations, as well as serves as a working device to accomplish earth-moving work. The main winch is a dual-capstan winch with a capacity of up to 35 tonnes, which can be increased to 70 tonnes with a guide pulley. The winch system is operable as far as 150 meters away from a target vehicle and allows prompt recovery of swamped and/or damaged vehicles. The K1 ARV crane can lift 25ton so that turret of the K1 tank could be removed in the field. It can accommodation a engine and transmission assembly of the K1 or M48 or M109 self propelled howitzer. The crane is hydraulically driven with a lifting capacity of up to 25 tonnes, which is adequate for most major missions. The boom on the right hand side of the K1 ARV is elevated from 0°to 70°by boom lifting cylinder and is traversable up to 270°. The crane can be remote-controlled by a joystick which ensures ease and precision in lifting the turret or powerpack of the MBT. If repairs to a vehicle’s suspension system are required, the crane system can raise the front or back of the vehicle allowing access to the damaged system. The K1 ARV has additional capabilities, i.e. powerpack transportation for repair service, and shunting operation in the garage. The ready-mounted refuel/defuel pump and welding machine, impact wrench, and automatic chainsaw make it easy to conduct prompt and complete maintenance and recovery service. The Integrated Test System(ITS) specific to the K1 ARV enables crew members to detect and repair damage or malfunction quickly, and guarantees excellent maintainability and reliability. In addition, the K1 ARV can be supplied with emergency power in 10KW 28 vdc outputs from Auxilary Power Unit(APU) while the main engine is not operated. A 12.7mm machine gun and a light antitank weapon provide firepower against enemy vehicles or personnel the crew may meet during service. Smoke grenade launchers are also prepared to conceal the vehicle from the enemy’s view and an Automatic Fire Suppression System and NBC-detecting system is also equipped to enhance the survivability of crew.